Drama at the start of this afternoon's LMP qualifying session, when the #47 KCMG Oreca in the hands of Matt Howson stalled on the climb up to turn 1, resulting in a red flag. When the green flag fell again, Porsche kept their clean sheet this season and scored a 5th consecutive pole. Marc Lieb and Neel Jani put down the fastest average time, after an amazing lap by Jani (1.46.00) during his second stint in the dying moments of the session. #18 on pole, right ahead of the #17 Porsche, both Audi's and both Toyota's. Rebellion took (as expected) pole in the privateer class. After their misfortune at the start of the session, the KCMG Oreca got towed back to the paddock, and joined in the qualifying session. Matt Howson and Richard Bradley stormed through the session, ultimately to take pole ahead of both G-drive Ligiers and the #20 ESM prototype. 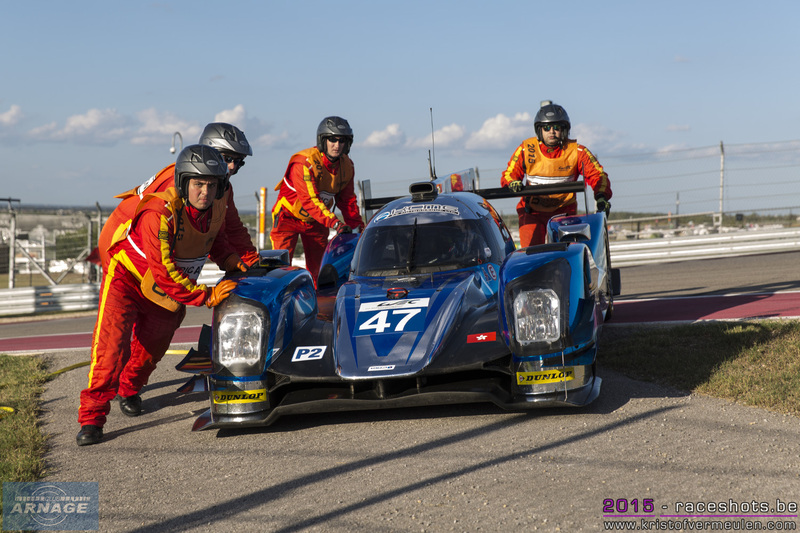 However, it's more than possible that KCMG will get penalized for rejoining the session again. LMP2 results are under investigation, so G-Drive might start from pole tomorrow. Misfortune also for the Signatech Alpine team, who ran into technical problems during their pitstop and weren't able to let 2 drivers set a time. 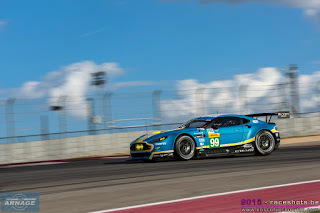 Surprise in GTE Pro with Fernando Rees and Richie Stanaway taking the pole in their #99 Aston Martin Vantage V8. Throughout the practice sessions, they've improved the car all the time, just in time to outscore the #91 Porsche and #95 Aston Martin. Both AF Corse Ferrari's struggled this afternoon and only managed to get to the bottom of the grid. Patrick Long & Patrick Dempsey scored their first ever pole in the GTE Am class, and where better to do that in your home race. Dempsey started strong, Long, who praised Dempsey for his progress in the last races, finished the job with an impressive qualifying lap. The Aston Martin #96 got second fastest, #38 AF Corse completes the top 3 in class. In both GTE classes the top 5 is only separated by a mere 0.5 seconds, we're in for another nailbiting battle between the GTE cars tomorrow. 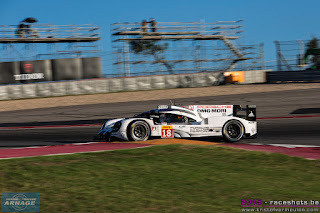 Earlier today it was Porsche all over again in the third and final practice session. This time it was Brendon Hartley (#17) putting in the fastest lap, ahead of Neel Jani in the #19 sister car and bot Audi's & Toyota's. In LMP2 this time it was Signatech Alpine who was fastest, ahead of KCMG and the Morgan of Team SARD Morand who put in their best performance of the season so far. GTE Pro was very close again, with Patrick Pilet putting the #92 on top. In GTE Am, Aston Martin got fastest with Pedro Lamy in the #98 ahead of the #50 Corvette. The morning session was briefly interrupted after a collision between the #26 G Drive Ligier and the #77 Dempsey Proton Porsche. The Ligier managed to get back out by the end of the session, the Porsche stayed in with a damaged left rear. 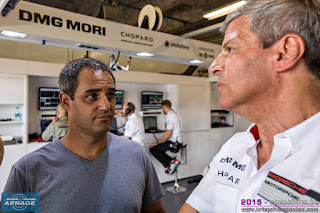 Remarkable guest at Porsche today : Juan Pablo Montoya. There are talks going round that the Colombian driver gets to test the Porsche 919 after the season. Montoya's contract in Indycar ends after the 2016 season, might he join the Porsche team afterwards. It could give him a shot to win the "triple crown of motorsport"; Le Mans, Indy 500 and F1 in Monaco. So far only Graham Hill was able to complete the treble. The 2016 WEC calendar should be presented at COTA this weekend, but so far it's been silent around the new schedule. Final negotiations with tracks would be going on but up until now without any news. Will the Nürburgring keep its spot after a successful edition (62000 spectators), will te prologue stay at Paul Ricard (or move to Monza as rumoured), we're all eager to know the answers. 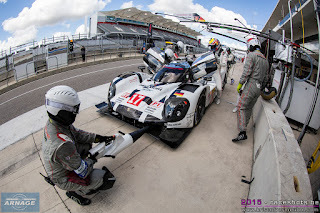 The Lone Star Le Mans 6 hour race into the night starts at 5 pm on Saturday (local time). Weather forecasts are hot, really hot with predictions of 38° Celsius and higher. This race will be exhausting for man and machine !